Home > Law Books > Forms > The Law of Transnational Business Transactions, 2018 ed. 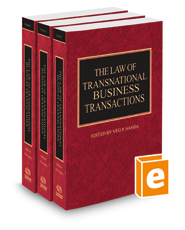 The Law of Transnational Business Transactions, 2018 ed. • Antitrust enforcement in the E.U. This title examines labor and employment law in the international context, and analyzes licensing, arbitration, agreements, business operations, relief mechanisms, and selected clauses. 90 days service included with the package.